In quest of a personal goal to create a perfect photograph of a poet or novelist reading their stuff aloud, I am encouraged to come across numerous Los Angeles area literary readings. 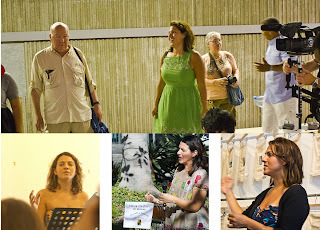 Some of the coolest gatherings of poets and writers invariably have the hand of literary artist Jessica Ceballos, who is today's On-line Floricanto poet. Los Angeles is poesia city, in large and generous measure due to Jessica Ceballos' work and inspired determination to bring poetry into public space. From subway platforms and rolling stock, to art galleries, to public parks, Ceballos finds no site unsuited to performing poetry. Ofttimes, Ceballos finds herself organizing poetry events, enjoying other poets reading their stuff, but infrequently finding a spot to read her own work. What an irony that, in the service of poetry, the poet doesn't get to make or do her own. 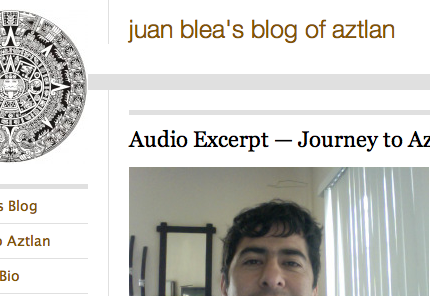 As promised in last week's La Bloga-Tuesday, today La Bloga On-line Floricanto lets Jessica Ceballos sing her own songs. First, however, a few notes from the mailbag. "Did you see, ASU has a job for a creative writer?" "Yeah, thousands of thousands are going to apply. Why bother?" "Someone's going to get it, why not you?" MFA with compelling publications, or a Ph.D. in-hand. Here's a link. Or maybe creative non-fiction by ear. At any rate, La Bloga friend Juan Blea advises he's put his reading of chapter 3 from his rules-bending autobiography, Journey to Aztlán, on his website. It's Blea's third book. There's no text, so click play and listen to the author recount the story. La Bloga On-line Floricanto: Jessica Ceballos • From here to there and back again, finding place, through constant movement. Jessica Ceballos is a writer who dabbles in music and photography. She's a volunteer, community advocate, avid traveler, and cultural wanderer. Raised in Highland Park and Eagle Rock and a third generation Southern Californian, she's been recognized by the City of Los Angeles for her work bringing literary arts to the community. As a writer, her work has appeared in Hinchas de Poesia, Haight Ashbury Journal and RA among others and she has featured throughout LA at venues such as The Last Bookstore, Beyond Baroque, Stories. She was most recently honored to join the Taco Shop Poets & Los Illegals at a standing-room only reading at Cal State San Marcos. As a member of the Hollywood Institute of Poetics, Jessica co-founded, organizes, and hosts the Bluebird Reading Series at Avenue 50 Studio in Highland Park, CA. In 2012 she took over as host of the Great Beyond open mic at Beyond Baroque in Venice. In the past, she has also co-facilitated their 20th Century Latin American Poetry Workshop. In 2013, Jessica was invited by Avenue 50 Studio to curate the Poesia Para La Gente reading series, taking place throughout the North East LA area. Poesia Para La Gente (Poetry for the People) brings poetry to the people of the community by holding open-mic readings in site-specific, non-traditional public spaces, inviting the community to share the power of poetry. Jessica studied English and Religion at Occidental College, and Interior Design at the Fashion Institute of Design & Merchandising in LA. She has designed furniture, fabrications and interior spaces. She's been a grant writer, a literary agent's assistant, youth development specialist, an A & R intern for a major record label, production accountant, a polar explorer's business manager, and has facilitated film production and business classes for high school students in Alaska - and she's loved every second of all of it. The days when he would come home, I'd jump into his arms and we'd kiss our way to the room where families begin, never happened...after that day happened. That day when everything became a question. "Our love was a different kind of love," he assured me while we held each other only halfway between where we last left our hearts, on that day. We had sampled the longing and lustful kind, the sad kind, the agreeing and smiling kind, the meandering kind of love. And after living two chapters of life hoping the lasting kind would arrive, I ran to the forest where trees of an entirely different kind grow, trees with flowering blossoms of dreams that don't need to come true. Where promises don't exist. Where obstacles are God's way of bringing us closer together. Our universe may be filled with the shadows of our own abandonment but the forests are where we find rest, make believe, truth, and love. paddling ocean waves of stillness. Falling in lust requires letting go of everything. A time to forget, experience awaits. The rebirth of an oscillating sun is implanting its memories under my skin. Burnt fossils fuel a certain brilliance and Kerouac could only dream of movement as existing as this, as lustful as this. It was a struggle to be so close. For her, not was okay. easing thoughts of my tomorrow. and a pretty clutch in hand to match. in her maternal longing, I absorbed her. I begin to earn the soul I was gifted. for a life that would prefer closeness. with the whole of the world. a new rock is born to the land. while others return from where they came. © 2012 Jessica Ceballos, all rights reserved. This poem first appeared in Hinchas de Poesia Issue #6.
with the stillness of a roller coaster. Until we move the variables. that something that changes everything. And she’ll wear rainbow-filled glasses. usually set aside for a soul. that promises to return my soul. usually set aside for wandering cars. set fire to my soul. in your direction. Yo prometo. where cobwebs once created shadows. and lives in its shadows. and make believe roads ahead. the cobwebs and shadows call home. © 2013 Jessica Ceballos, all rights reserved. that you begin to see a city becoming. up fancy hills made for suns, moons and stars. race through alley ways, hiding from history. uncertainty as thick as smog. from the scent of led memories. would we listen to their stories? dreaming of magical places to live. for those who call this home.